The tables herein are absolutely, utterly and totally random, and apart from a one-page, really nice b/w-artwork…that’s kinda it. So…what’s the use of this pdf? What do you do with it? Well, use number one, is simply to get the creative juices out of a routine, but the introduction proposes another use – a means for the GM to challenge themselves. 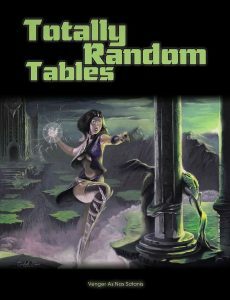 Roll a couple of times on the table before running the game, and see whether you can integrate the disparate elements. Those are actually the uses of this pdf that are truly salient and work – as noted, for dressing, this is, well…too totally random. You can use the gratuitous whitespace to scribble GM notes either before or during a game.